Historic Jamnagar in the rich state of Gujarat; old world architecture juxtaposed against a vibrant economy. 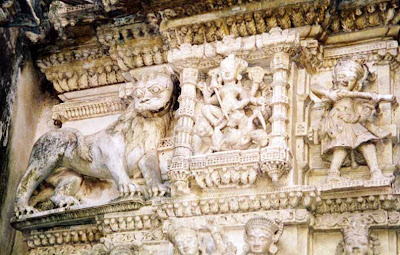 The above carving portrays a lion on the left, Goddess Durga in the center, and a soldier with a musket on the right. The carving is from the old Dabargadh, the former royal residence of the Jam Sahebs of Jamnagar, built in a fusion of Rajput and European style of architecture. Jamnagar was founded by Jam Rawal, a Jadeja Rajput who came from Kutch in 1535 AD. The city, located in the Kathiawar Peninsula of Gujarat, was modernized by cricketer Maharaja Kumar Shri Ranjitsinhji in the 1920s. Rajputs in Gujarat write 'Sinh' (Hindi word for lion) while Rajputs elsewhere use 'Singh'. The Kathiawar Penuinsula is also called Saurashtra. Maharaja Ranjitsinhji later built the Pratap Vilas Palace, with it's architecture inspired by the 'Victoria Memorial' of Calcutta with beautiful traditional carvings of birds, animals, creepers and plants. Its three domes are made of glass and it is a prime tourist attraction. After Ranjitsinhji the most famous ruler was Digvijaysinhji, also a cricketer, but more famous for being chancellor of the Chamber of Princes and the first Rajpramukh of Saurashtra state who sheltered. Digvijaysinhji was first chairman of the Somnath Trust which was the organization in charge of the Somnath Temple reconstruction. The Lakhota Lake (photo from Panoramio) is in the centre of old Jamnagar and is the winter home for hundreds of migratory waterfowl from Central Asia, Tibet, and Siberia. In the middle of the lake is the Lakhota Fort, rumored to have an underwater tunnel linking Jamnagar to the nearby Kutch Peninsula. The fort now houses a museum, which contains a fine collection of sculpture and weaponry, from the 9th Century to the 18th Century. Near the lake is the Bhujia Kotha, which housed old Jamnagar's arsenal. One of its most interesting sights is an old well, the water of which can be drawn by blowing into a small hole in the floor. The old Jamnagar Railway Station, built in 1897 and known for its Victorian architecture, may soon by converted into a modern hotel. The station was used by the royalty of Jamnagar and other states in Saurasthra and Gujarat; it still has imperial waiting rooms for the royal travellers.